MyQuery 3.5.4 Released - Now with Client side dynamic columns! It was quite a while ago since I released a new version of MyQuery, my Windows based query tool for MariaDB and MySQL. I did build a 3.5.3 version, but I decided not to do a public release of that. But now we have 3.5.4 ready, and there is some new shiny features in it. The main feature is that the dialog that you can use to inspect individual fields with, which pops up when you doubleclick (or now you can Right-click and select Show Menu) in a field, has been expanded. To being with, you can use this to navigate the fields, so that you don't have to close this dialog and open it in the next field, instead there are navigational buttons in the Dialog. But there is also some additions to the dialog itself. If you are using MariaDB and the Dynamic Columns feature, which is mostly used with the Cassandra Storage Engine but can be used with any blob data in any engine, then you can view these in the ShowData dialog, either as a tree or as JSON. Another addition is that I have upgraded help links to MySQL 5.6 and MariaDB 10. Also, a lot of MariaDB features and now syntax coloured as appropriate. Another usability feature is the ability to copy a single column from a query result to the clipboard. Download MySQL 3.5.4 from sourceforge and enjoy! I re-read "The Soul of a new Machine" (Swedish translation "En Dators Födelse") by Tracy Kidder the other day and it still quite a marvelous book. It was a long time ago since I read it last and I have to admit this really made me feel old. And I admit: Yes, I worked with VAXen (yes, that is what pluralis of a VAX is, among us hackers from the days when being a "hacker" was a good thing. I used to be called Anders "Hackin'" Karlsson back then) and I worked with Data General machines and I have also worked as a Hardware Engineering back when working with a CPU was not necessarily something done in software and when if you didn't have enough bits in a register in a register in the CPU, you could add them yourself with some TTL chips piggy-backed onto the ones on the main board itself (in this case the "register board") and then attached at appropriate points with hand-soldered wires and some paths on the board appropriately cut. 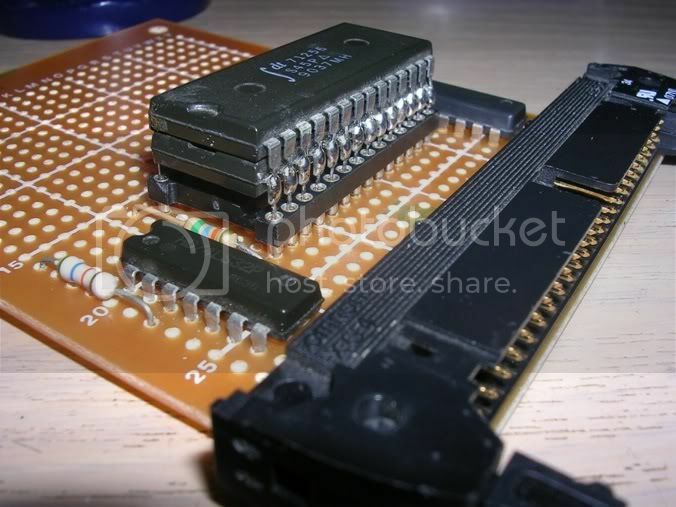 But instead of connection all pins you just connected the power and grounds ones (on the upper right and lower left corners respectively) and the other pins were bent to point straight out, and then you soldered the wires to these pins and then attaching the other end of these. And before you ask, before going on to do this, this had to be designed, somehow, and I did that too. In addition, you had to understand the original design of this, but that I figured out without too much work, What I never did do was to write even a single piece of code for this monster machine. How I got involved with this was interesting. I was working as a sysadmin for the development system machine for this box, which was a PABX based on Meridian but modified by Swedish Televerket (not Telia). When this localized version needed upgrading (as machines requiring higher capacity had been sold), it was assumed that the newer Nortel Meridian parts could be used. But this rurned out not to be that case, Nortel and developed the Meriad further since the Localized version was released, and the local version had also changed, but in a different direction, the parts actually wouldn't even physically fit! Disaster! What do we do NOW? The customer has already bough this thing and now we can't deliver? And in Sweden, there wasn't much hardware enginering resources for this puppy anymore. So someone the manager of the development of this box thinks a bit and then realized that there is this weirdo young sysadmin, who by the way knows absolutely nothing about Meridian (but a fair amount about the development system for it, which was running Unix, Interactive Unix, based on Unix Version 6, no less! running on a PDP/11 70). This sysadmin boy had at some point said something that he was building his own home computer (which I was) so maybe he could have a look at this? Now, I was not the least qualified for. Not at all, so I obviously said no... Not! I think many of you were like that in your twenties also: You knew just about EVERYTHING on computers, and if someone asked you to do something, you just said yes. In this case I was asked to extend the page bank register in the SL/1 (which was the technical name for the Meridin and was a 16-bit machine with multiple 64k banks of memory). Did I get this to work? Yes, I did. Don't ask me how, though. Today, some 30 years later, I still don't understand how I managed to do this, and if I was asked today, stuffed to the rim with training, knowledge and experience, to modify the CPU of some machine, I would assume the person asking had used excessive amounts of paint remover, but not with the intent of removing paint but with the quite successful intent of removing whatever small portion that is left of common sense from his/her brain. This was my last job at Telia / Televerket (not because what I did didn't work. As far as I know, the CPU I designed and then built, was put in beta test at the Telia office and when I later called an old colleague there and asked what happened to my Heath Robinson style PABX I was told that it was in daily use and that I was, in fact, using it right as we spoke). After this I joined another telco operator and then I went on to work for Oracle, where I at first was the local VAX guy and later the local Unix guy (also, I was the local Mac guy as I was the only one there who had even used on, and I had used it to run Pagemaker for editing a fanzine that I was working on at that time). OK, time to wake up. Maybe I should port MySQL to the SL/1 or something today? But I need an extra bit in the pagebank register for that I guess? Well that can be fixed, is there some young, unsuspecting sysadmin around? Also, read "The Soul of a new Machine" if you haven't done so. It does say a lot about how people in the IT indistry work and how we look at ourselves. And it's a probably a good read for a spouse or girlfriend/boyfriend who is not in the IT-industry, as this is not really a technical book (except to a very small extent).